This Psalter is named after one of its owners, John Grandisson, who was bishop of Exeter from 1327 until his death in 1369. It was adapted for his use, having originally been made for someone who perhaps lived in the area of Chichester. Psalm 80 begins 'Sing aloud unto God our strength: make a joyful noise unto the God of Jacob'. 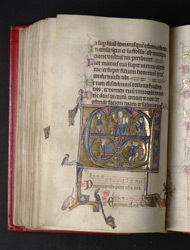 The initial to this Psalm depicts musicians playing music before Christ, and Jacob wrestling with the angel (an event recounted in Genesis 32:24-32).